There are a bunch of different portable projectors you can use to beam a nice big picture from your smartphone, tablet, or computer, and plenty of them do a great job. As good as some of them are, none of them are quite like the Nebula Capsule Smart Mini Projector by Anker. This compact portable projector is the size of a soda can, and yet it has two key features most comparable models don’t. First, you can connect wirelessly from any iOS or Android device, which is a huge benefit compared to carrying extra cables with you. Second, it has built-in speakers that offer surprisingly good 360° sound. 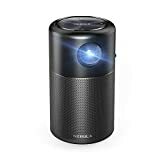 The Nebula Capsule is a bit pricey at $349, but the coupon code 4CAPSULE drops the price to just $277.99, which is a great value that matches the projector’s all-time low. NOTE: Copyrighted content from Hulu, Netflix, and similar services CAN NOT be mirrored or screencast. Download and use the apps directly through Capsule to view copyrighted content from these providers. Chromecast is not supported.